My computerised system of putting the results up on the big screen I nicked from work works a treat. The only problem is that the computer I took doesn’t work when I get it home. Not sure what’s gone on there as there seems to be a problem with the power supply. Whether that’s the power at the arena or at home I’m not sure. In the evening we go see the ‘must see’ film of the year e.g. La La Land which is, of course, also a musical. So never before have I been ready to hate a film so much because I really dislike pointless singing in films but we always try to see all the Oscar nominees so... here we are. What’s worse we’re even at the Cineworld multiplex as our local independent Broadway is fully booked. The omens are not good, not good at all. First I think a stiff one is in order and we have a drink in the Hop Merchant which is the latest incarnation of the former Turf Tavern. Then, it can't be delayed any more. I immediately feared the worst when the film opened with a scene that was practically straight out of Grease. Grease isn't a bad movie, just not really my thing at all, and people sing ‘n’ dance in traffic jams all the time, so nothing pointless about that. It happens every day on my commute down the A52. This however was a pivotal moment, things got a whole lot better. 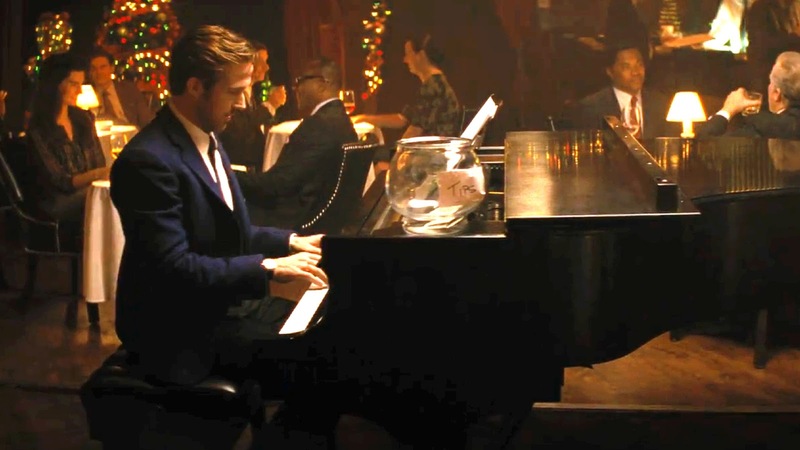 La La Land tells the story of Sebastian (Ryan Gosling) and Mia (Emma Stone) who first meet in that all singing all dancing traffic jam in Los Angeles, presumably the LA in La La, in what becomes the first of several chance meetings. 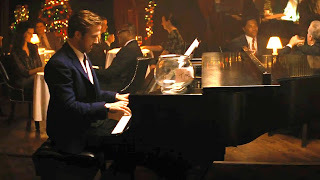 Sebastian is a frustrated jazz pianist who dreams of opening his own jazz club but is stuck playing Christmas songs in a bar just to make ends meet. That is until he finally cracks, plays something different and gets sacked. As he storms out he brushes past Mia who was about to approach him in chance meeting number two. Mia is a prospective actress but who works in a coffee shop on Warner Brothers' lot while she awaits her big break. Unfortunately audition after audition just deals her rejection after rejection. Mia again bumps into Sebastian at a party where he is in the band that are playing. He’s looking very bored as they cover A-ha’s ‘Take On Me’ but that’s nothing to how he looks when they take requests from the floor and Mia asks for ‘I Ran’. They don’t really come much more uncool that the uncool 80’s band that were Flock of Seagulls, unfairly so me thinks, and it’s like a knife in the back for our frustrated jazz pianist. The song is perhaps also an appropriate comment on the Mia\Sebastian story so far. It probably means something... he says of their third chance meeting, probably not... she replies, as they finally get to talk. They get together and we follow them over the course of the next four seasons as they urge each other to pursue their dreams but while eventually Mia does and starts her own one woman show, Sebastian goes on tour with a band playing music he doesn’t really like just for the money. He is away so often it kills their relationship. Yet it is Sebastian that turns up out of the blue to pick Mia up off the floor after her show fails and forces her into one last audition which is the one that finally lands her big break but that takes her away from him, possibly for good. Five years on they have another chance meeting. 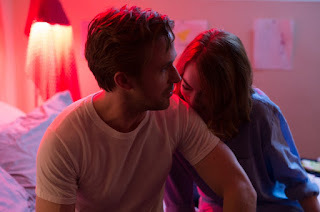 Sebastian has finally started his nightclub while Mia has moved on with someone else but... what if... and this is the deal with La La Land, everything has a 'what if'. The big one is whether Mia and Sebastian should pursue their dreams and their art or just go after the money? Do they then end up together? Meanwhile the film take a swipe at Hollywood for having the same choice and repeatedly picking the latter. What if Hollywood doesn’t make Star Wars 27 and Rocky 46? Ha ha. In between there are clever references to classic films such as ‘Rebel without a Cause’ which is an interesting choice for their first date and which Mia had to dump her current bloke to get to. The other thing is that this isn’t really a musical, it’s just a damn good film with a decent soundtrack that they happen to sing rather than play in the background but it also has a message, a decent plot, a lot of cleverness and some astonishing cinematography, if bordering on the surreal at times. It’s happy, it’s sad and I do love an unhappy ending but of course, different people will see different things in this film as I’m sure is the intention. 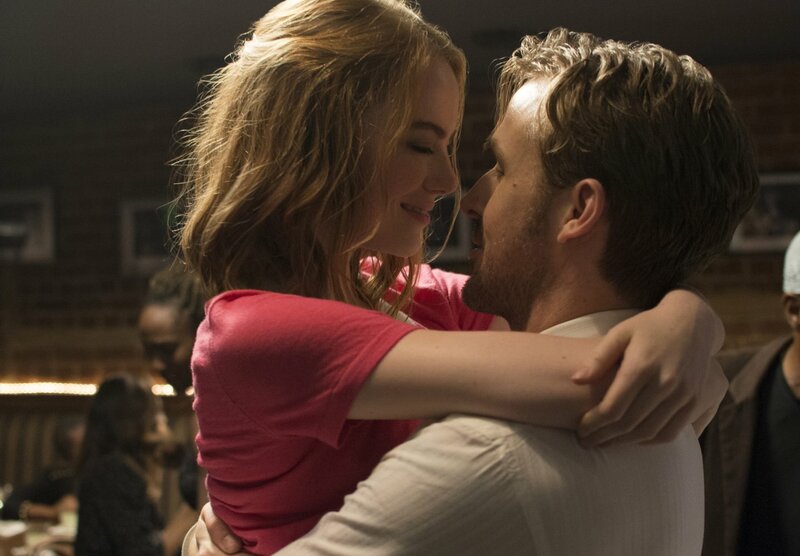 Emma Stone is simply amazing, which ought to make the whole thing disappear down a massive plot hole as she plays a girl who can’t get an acting job. 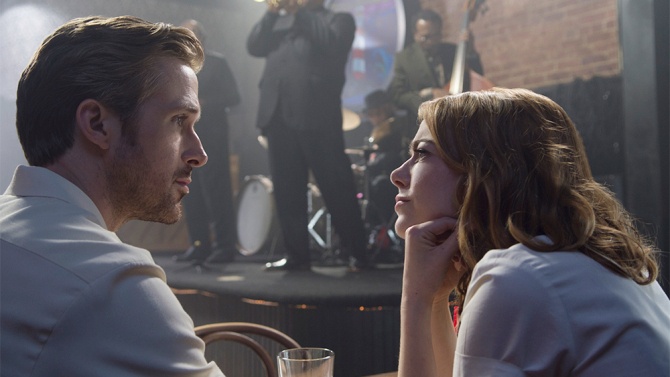 Ryan Gosling meanwhile tries to not look out of his comfort zone and I think gets away with it. I shouldn’t really have doubted the film as it’s directed by Damien Chazelle who made the excellent Whiplash, another jazz filled film, and this also features the brilliantly humourless JK Simmons as Sebastian’s bar owner boss. The worrying thing for the Oscar competition is that this is such a good film as it is but imagine how good it could have been if they’d left out the singing and dancing. Doesn’t bear thinking about. Fellow musical haters face down your demons and go see it. The debrief takes us to the Scribblers and the Blue Monkey as usual.